Hong Kong, (香港 Heūng góng in Cantonese, Xiāng gǎng in Mandarin, either way meaning "fragrant harbour") the Oriental Pearl, is simply amazing!It would be hard to find a more exciting city than Hong Kong. Set among beautiful natural surroundings it has all the benefits of a thriving and vibrant commercial center. Here you can find the delights of modern living alongside an abundance of reminders of its historic past. Whether you visit the better known highlights like the stunning Ocean Park, the fantastic viewpoint of Victoria Peak or the beautiful Repulse Bay, Hong Kong is certain to exceed your expectations. Population: 6.8 million. 95% are Chinese, the rest are foreigners. Language: Mostly in Traditional Chinese and English. But Simplified Chinese are increasingly popular as there are more mainland Chinese visitors visiting Hong Kong. 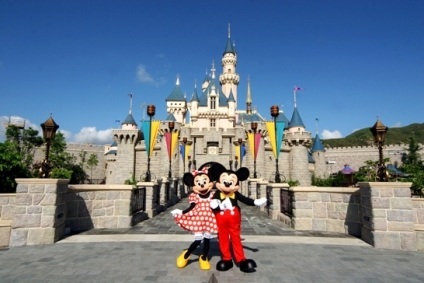 Hong Kong Disneyland (香港迪士尼乐园 xiāng gǎng dí shì ní lè yuán) is the first theme park inside the Hong Kong Disneyland Resort and is owned and managed by the Hong Kong International Theme Parks, an incorporated company jointly owned by The Walt Disney Company and the Government of Hong Kong.The fifth Disneyland style park, the park is located on reclaimed and in Penny's Bay, Lantau Island. After years of negotiations and construction, the park opened to visitors on May 22, 2005, considered an auspicious date according to Chinese almanacs for the opening of a new business. Disney attempted to avoid problems of cultural backlash by attempting to incorporate Chinese culture, customs, and traditions when designing and building the resort, including adherence to the rules of Feng Shui.The park consists of four themed lands similar to other Disneyland parks: Main Street U.S.A. (美国小镇 měi guó xiǎo zhèn), Fantasyland (幻想世界 huàn xiǎng shì jiè),Adventureland (探险 tàn xiǎn) and Tomorrowland (明日世界 míng rì shì jiè). There is as yet no Frontierland, although it may be included in future expansion projects. The theme park's cast members use English and Chinese, including Cantonese and Mandarin dialects, to communicate verbally. Guide Maps are printed in both Traditional and Simplified characters, Japanese, and in English. Lemma Island (南丫岛 nán yā dǎo) , which lies at the southern part of Hong Kong, is the city's third largest island. 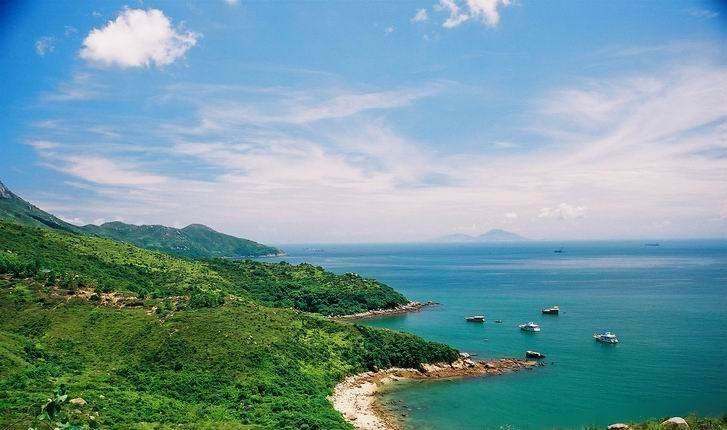 With the immense sea, the clean beach and the brilliant coastal scenery, Lamma Island attracts more and more tourists to spend their holidays at the island. The ease of life on Lamma Island lures a lot of foreign expatriates and office workers of Hong Kong to live here. The Po Lin (Precious Lotus) Monastery (宝莲寺 bǎo lián sì ) is located on western Lantau Island, known as the 'Buddhist Kingdom in the South', it is one of the well-established Buddhist monasteries in Hong Kong. Serving as a Buddhist retreat, this monastery was originally built by three monks in 1920 with only a shrine dedicated to Buddha. 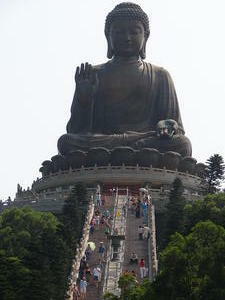 In 1924, it was renamed 'Po Lin Monastery' and many monks gradually settled there. Since the 1930s, the monastery has been expanded with additional larger halls and temples added to it. In the 1970s, it became one of the top 10 Buddhist monasteries in Hong Kong.The main building at the monastery is the temple, although the decorations inside are very simple, which does not tend to overwhelm visitors with the glamour of Buddhism. 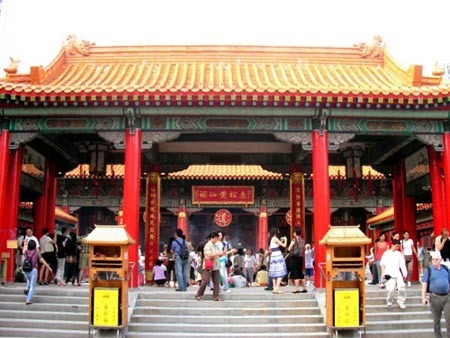 It does not even have the traditional atmosphere as founded in Man Mo Temple on the Hong Kong Island.